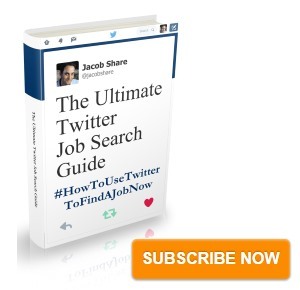 Win it for yourself, or another Gen Y-er who wants to get their career off to a good start. Simple – at the bottom of this article, leave a comment about why you should win. Or- impress me with constructive feedback about JobMob and how I can make the site better for you. They Don't Teach Corporate in College has resonated with tens of thousands of readers and is currently used as a text in corporations and universities across the country. This new and updated edition reflects the unique needs and challenges of current twenty-somethings, who want to make a difference right now but lack some of the core skills to make it happen. It incorporates fresh tips for building your transferable skillset, networking and enhancing your productivity in an increasingly digital world, and becoming an effective leader. Alexandra Levit's goal is to help people succeed in meaningful jobs, and to build relationships between organizations and top talent. A former nationally syndicated columnist for the Wall Street Journal and a current writer for the New York Times, Alexandra has authored six books. She has advised the Obama administration on critical workforce issues and has consulted for and spoken at hundreds of organizations around the world. Frequently appearing as a spokesperson in major media outlets, she was recently named Money magazine's Online Career Expert of the Year and the author of one of Forbes' best Websites for women. A member of the Northwestern University Council of 100 and the Young Entrepreneur Council, Alexandra resides in Chicago, Illinois, with her husband, Stewart, and their two young children. 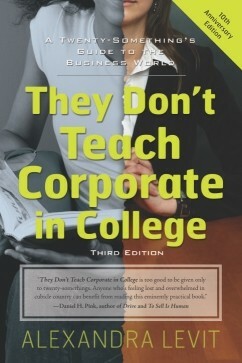 3 free copies of the hardcover 10th anniversary edition of recently-published They Don't Teach Corporate in College (which has a list price of US$15.99) are available to be won, including shipping & handling to wherever you are in the world. Next job was in a small company of automotive bussiness, Germany, testing car user-interface software. Then another American corporation and finally a real start-up experience which lured me strongly. Now I am back in corporate hoping to stay there for many years. 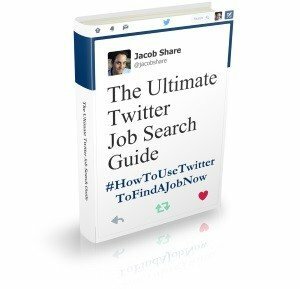 I’m a college instructor and I am always looking for new information that might give my students the edge when they are looking for a job. “They Don’t Teach Corporate at College,” could be that edge. I am a Peak Performance Career Coach partnering with college students. Recruiters and hiring managers consistently report colleges students are inadequately prepared for the workplace. I am seeking an evidence based resource that will aid my clients to not only survive but to succeed beyond measure in the workplace. Alexandra Levit’s 10th anniversary edition, “They Don’t Teach Corporate in College”, would be an excellent addition to my recommended book list. and then he may understand what I told him about it too! A nephew of mine recently joined the workforce and I have an idea that it is difficult for him to understand the corporate world. This book would help him much! Several nephews are in the process of starting out in the corporate world and have no clue what to expect and how to handle things in a better way. This book would be a great gift to them! Great comments, everyone. Keep ’em coming. If anyone was getting an error message when they tried to post a comment, the problem has now been fixed. The winners this time around are: Gideon, Elizabeth and Ján. Congratulations! I’ll be in touch with you asap regarding how to claim your prizes. And there’s no time to rest, with another comment contest coming out here on JobMob later today.